Happy Throwback Thursday everyone! Let’s talk about a very old manga that has graced my husband’s bookshelf since our middle school days. 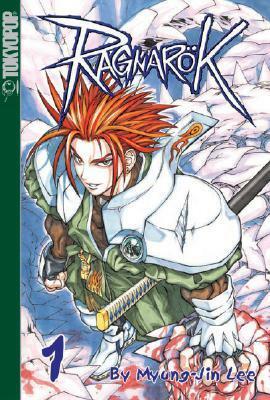 Ragnarok, Volume 1 by Myung-Jin Lee was the first manga he ever managed to convince my mother-in-law was appropriately priced despite the book’s real lack of words in the traditional sense. So, for a manga that’s been tucked away between multiple volumes of Black Cat and Trigun for the past almost twenty years, how is it? Its…pretty good. I mean. I enjoyed it. I enjoyed it a great deal, actually. I have a real soft spot for anything shonen. But Ragnarok does have some glaring, obvious flaws which simply cannot be overlooked. First, a little background. Ragnarok is about, well, Ragnarok in the traditional sense – the fall of the gods. The Valkyries have been dispatched by the gods to find and destroy those responsible. Meanwhile all Fenris wants is to find her long ago companion who is also freshly reincarnated. Oh and maybe change the world if they’ve got a little time to spare. Something that will help in your reading of Ragnarok is a familiarity with Norse mythology. Many of the names and some of the lore is borrowed heavily from Norse mythology and even a passing familiarity with, say, some of the names of the gods will help you a great deal when first getting into this volume. A lot of characters are introduced pretty rapidly. Many, though not all, of these characters have some sort of descriptor of who they are or what their job is, but reading this book would have been very difficult if I’d known nothing about Norse mythology beforehand. Even some basic knowledge on how in different mythos work would be very helpful to have here. Now, this is a shonen manga through and through. You can tell by the nearly full page render of a massive explosion on page 3. Ragnarok picks you up and drops you right into the thick of things. Then it picks you up and drops you right in thick of things with Chaos and Iris, two new characters. Then it does this again with a loveable but somewhat bumbling ‘treasure hunter’ who’s totally not a thief. Then it does it with the villains. And. Well. I’m sure you get the picture. There is a truly asinine amount of jumping around here. Some of these characters do meet up fairly early on, so this is a bit forgivable. However, this doesn’t happen one time. It happens multiple times. The sheer volume of new characters you need to remember can be a bit overwhelming, especially since most of them do feel as if they are important characters whose plots and we will be following rather closely throughout the series. With the switching of points of view comes a tone shift. There is a massive tone shift in scenes featuring Fenris Fenrir and the trio of Iris, Chaos, and Lidia. This is so extreme it almost felt like I was reading a separate manga. Following the trio is like reading something like, oh, Slayers maybe. It has some good fight scenes, decent plot and world building, but humor is the name of the game a good portion of the time. However, things are much darker and grittier when Fenris or any of the multiple villains or the god’s lackeys show up. The art style is pretty good. A lot of detail is put into scenes, especially fight scenes. Backgrounds in particular have a lot included in them. This is to the manga’s benefit. The ruins Fenris walks through in the beginning really feel like the ruins of a temple. The architecture is detailed and striking without ever being the real center of attention. These beautiful spreads featuring the architecture or city landscapes are dotted throughout the manga, usually found when a character is talking or something is being explained to the audience. Characters are also well drawn and, for the most part, highly detailed. Which is very important because there are just so damned many of them. So, how many characters are introduced? By my count there are fourteen named characters plus the token talking animal mascot. These fifteen characters encompass our heroes, the villains, and some assorted minor characters. Having so many characters introduced in so short an amount of time can be confusing. So pay attention when reading, folks, and be prepared to jump to an entirely new set of characters ever dozen pages or so. Despite the sometimes glaring issues, Ragnarok is still fun. There are over the top battle moves, their excessiveness softened a bit since there are literal gods in the story. Lots of things explode. And the characters are all pretty likeable. The plot is intriguing. And there are a host of unique demi-god-like beings of ever intensifying power and importance we get to see battle one other. I’d probably continue the series if I knew there would ever be more than ten volumes to the series and no conclusion. And maybe there will be. One day. In a future far, far away. See, Ragnarok is the original source and inspiration for Ragnarok Online, the MMORPG, and its many more modern iterations. The creator, Myung-Jin Lee, has put Ragnarok on indefinite hiatus so he can work on the games. Sad, but somewhat unavoidable, I suppose. Maybe one day the series will continue. While I enjoyed reading Ragnarok, this is not one of the best manga I’ve picked up. It was fun and passed the time, but did have some pretty big drawbacks. If you like shonen or have played any of the Ragnarok Online games you will probably enjoy this series. If you don’t like manga with huge casts of characters or stories that jump around from place to place or character to character Ragnarok probably isn’t for you.